So given that there may be continued debate on the project and the public comment period is closed, let’s look at the rationale for including trail on both sides of Wentworth. This stretch of Wentworth is narrow with minimal shoulders and with poor sight lines. The reconstruction project is updating Wentworth from a rural to an urban section of road, adding appropriate storm sewers and addressing safety issues. Improve safety for all transportation modes (vehicle, bike, pedestrian). There are pedestrian destinations on both sides of Wentworth and few safe places to cross. Trail on both sides will minimize mid-block crossings, especially compared to trail on one side. Adding trail on both sides of the road is 2.2 times safer than no trails. Trail on only one side of the road is only 1.5 times safer. In 10 years there have been 7 reported crashes involving bikes/pedestrians on this stretch, so these changes are definitely needed. If we ignored this rationale and worked to put trail on one side or the other, there are arguments for both sides (existing trail on the north side, new entrance to Marthaler Park on the south side). The best approach seems to be a comprehensive solution that maximizes safety. 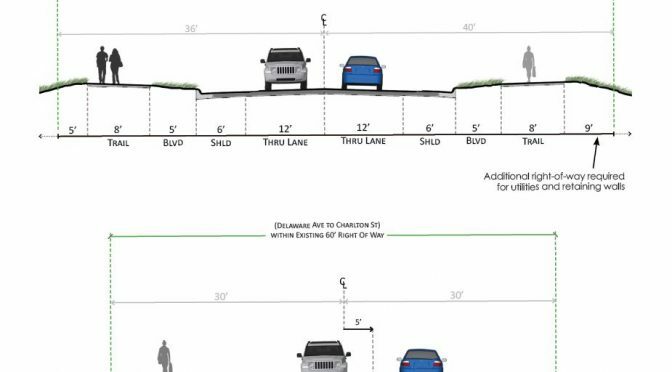 Furthermore, this will connect to the county’s River-to-River Greenway trail, vastly improving access to that trail. As that trail is completed, usage and demand will increase. Now is the time to update the infrastructure on Wentworth to be prepared for the future. While the total cost of this project is $6.15 million, West St. Paul is only responsible for $1.31 million (likely lower with the sewer costs removed). A $984,000 federal grant will cover the trails. A specific cost breakdown is not available, but given the federal grant and county’s willingness to pay for trail improvements, it seems unlikely that scaling the project back to trail on only one side would save West St. Paul much. If anything, we’d just be leaving federal grant dollars on the table. This is a key opportunity to improve our bike and pedestrian infrastructure without bearing the entire cost ourselves. You can contact the West St. Paul city council and let them know you support trails on both sides of Wentworth. You can also attend the Dec. 10 meeting to show your support (though it’s unclear if any public comment on the project will be allowed). Property Owner Meeting Summary (PDF) – Has some helpful Q&As covering a lot of the concerns raised. City Council Report for Nov. 26 (PDF) – Includes project costs (including sewer, which will likely be dropped). At the Dec. 10, 2018 city council meeting the Wentworth reconstruction project passed unanimously as presented.